I made this small cut-out stamp as a complement to this family of stamps. The shape has always reminded me a little of the battleships in some of the computer games when I was a child. White ink is successful on almost any background colour. Use it when you are not sure what colour you should use. It is a great default to fall back on if you run out of inspiration. Gold and black are also great default colours to use if you feel afraid about any other colour choice. This is a good place to start if you are a beginner who wants to try out a little bit of easy dyeing and a little bit of easy printing in one project. 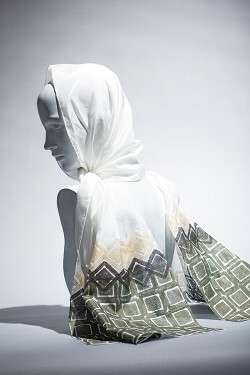 You can knock together this gorgeous silk scarf in less than an hour and wear it the next time you leave the house. I love the immediacy of these techniques. Many people assume that finishes need to be bold or in-your-face to have value. 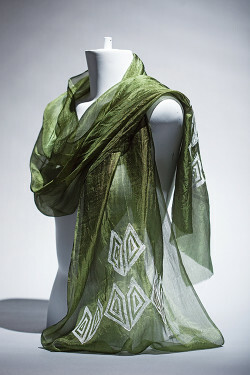 Soft, subtle patterns are awesome and when you print in an ink that almost matches the base cloth you get effects that can be seen at certain angles in the light and that are almost invisible from other angles. Effects like these work very successfully for bridal wear. 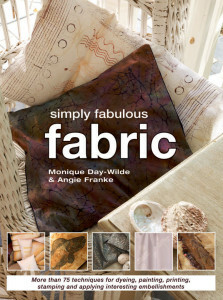 I chose a heavyweight silk with a course texture in cream for this project because it drapes so beautifully. 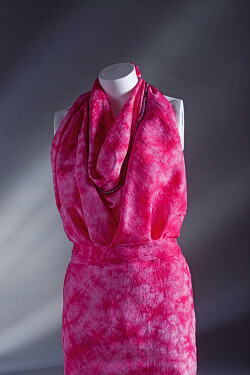 This crushed pattern can be transformed quite radically by using three colours rather than one. 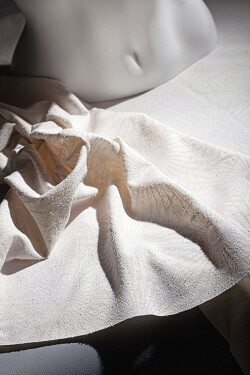 For this project I worked on a textured Damask silk to add more depth to the finished work. 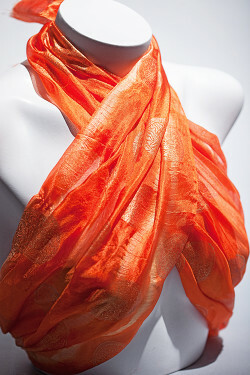 The pattern on the shiny silk lends itself well to bling embellishments. 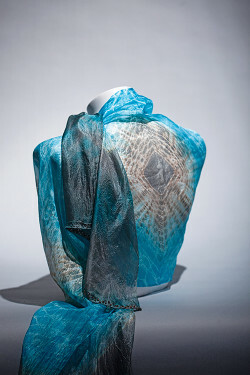 Glue or stitch on some shiny blue sequins and transform this silk into a glam accessory that you can wear out to any big evening event. 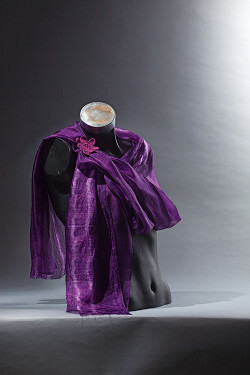 By making a couple of small changes to the methodology of the previous project, it is possible to create a centre panel on your scarf. 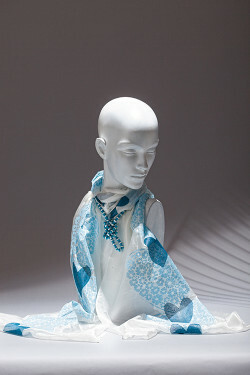 This pattern will dress down as a top for daywear on the beach and it will dress up as an evening accessory. This is a classic example of “less is more”. 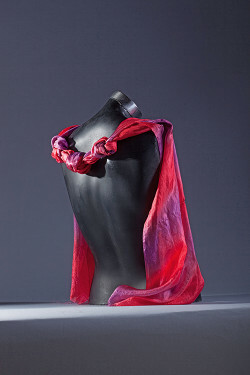 I always tell my students to keep it simple and one day one of them showed me just how simple it could be with this easy focal point on each end of the scarf. 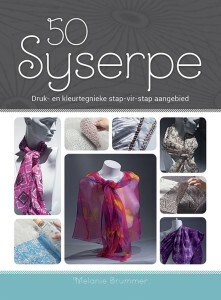 We are going to create a border along both edges of a scarf for this project. This means that the process below must be applied to both ends of the silk. A simple striped border along the cloth is all that is needed to turn a plain coloured scarf into a special handmade piece that pops. 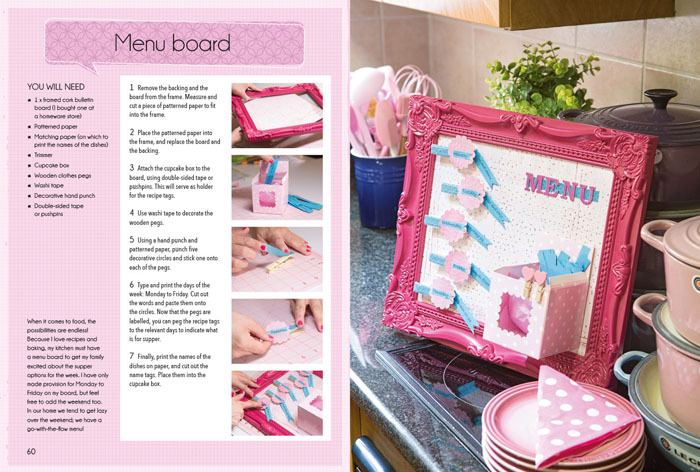 This project is very easy and it always creates a happy result, provided you get your elastic bands tight enough. This fail-safe pattern is a great place to start for beginners who are nervous. I often use this pattern for demonstrations during my classes and it always delights my students with its magical outcome. 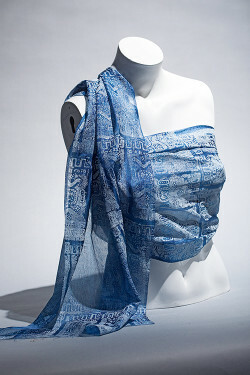 This stunning silk scarf will finish a navy corporate suit to make a confident statement at any meeting. Choose structured geometric patterns in corporate colours like black, navy and red to accessorise your simple suits. Red and black are classic corporate colours and the orderly geometric design is well-suited to office wear. 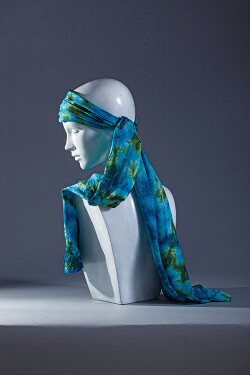 This is one of my favourite scarves to make during demonstrations and no matter what colours I play it out in, it is always a hit with my students. Reverse the colours from the previous project, using the same stamp, and the effect is radically different. 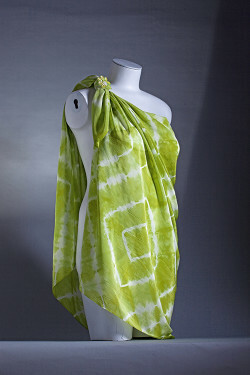 It is possible to create checked patterns with tie-dye. 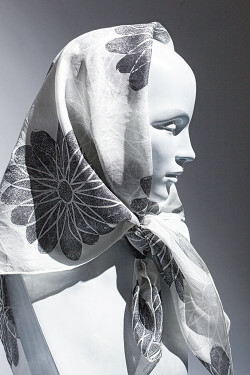 The structure of the fabric will govern how crisp and clear these geometric designs come out. 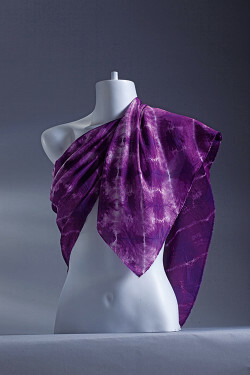 The silk that I used for this project is quite floppy so the pattern is a little distorted. Crisper fabrics will give clearer checks. You can turn the striped effect onto the diagonal on the cloth by changing one small thing in the way you bind the cloth at the start. 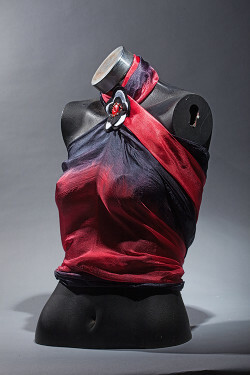 I used a lightweight habotai silk for this project. 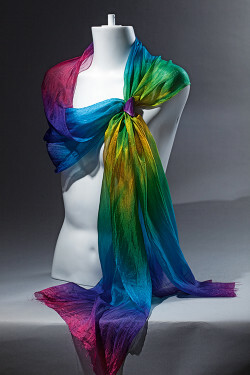 Although many people love spiral tie-dye, my favourite pattern to play with must be the diamond. I enjoy playing with placement and colour to find fresh new ways of interpreting this simple concept. 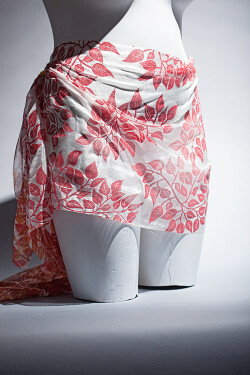 I made this pattern on a large piece of crêpe de Chine so that I could play with the placement of the shapes and so that I would have the option to wear it as a sarong on the beach. There is a very easy way to get a similar result and I prefer to use this technique when I need to make a dip-dyed look quickly, without all the fuss of building the jig. Very few people actually notice the difference between the one technique and the other so I will show you both and you can decide which one best suits your needs. Stick to the controlled methodology for a smooth finish, while you can use this methodology when the outcome can be magical and slightly textured. Sometimes we can replicate dyed visual effects using prints. 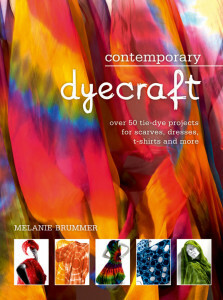 A dip-dye is understood as one colour that bleeds into another colour. By printing chaotic prints in layers of different colours, it is possible to create a visual effect that looks very similar to the dip-dyed effect. Although many people view dip-dyeing as a form of tie-dyeing, I prefer to think of it more in terms of a smooth, flat colour that you are bleeding on in a very controlled way. I feel this way because we do not use a single elastic band or piece of string to bind the cloth. This technique takes a high level of concentration to get the colour absolutely smooth and splash-free. It is also very beautiful and trendy in the fashion capitals around the world and if you have the courage to try this technique for yourself, you will be greatly rewarded. 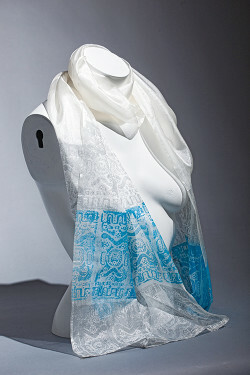 For this project I used a damask silk with a paisley in the weave to add subtle detail to the simple finish. 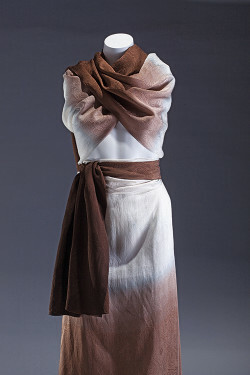 I worked directly onto the creamy background cloth, which works well with the dark brown dye. 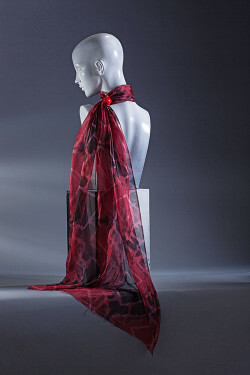 Black and silver are classic colours for evening accessories and this square scarf in shiny heavyweight silk will keep the chill out, while looking elegant and beautiful. Although this project looks similar to the one before, because you are binding multiple shapes, it will take you longer to tie up the cloth. Do not embark on this project if you are in a hurry. The extra effort is well worth the extra work, though, and I find this pattern captivating. I have manufactured this finish many times for the fashion industry in many different colour ways and it is a guaranteed success every time. 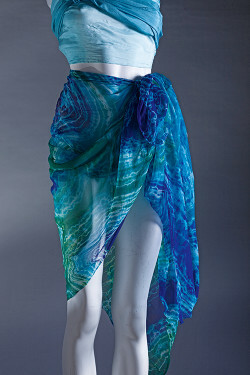 I chose colours from the sea for this one so that I can wear it as a sarong on the beach. 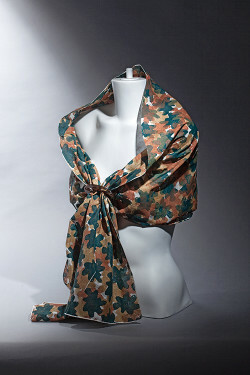 Camouflage fabrics are no longer only used by the military, they have become a staple of our fashion industry. I enjoy looking for ways to make urban camouflage using my own unique colours. This striking project adds an Indian feel to the finished piece. 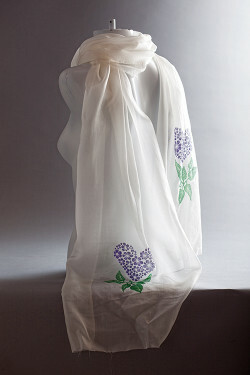 I imagine it will also look very lush on a red or turquoise base cloth. 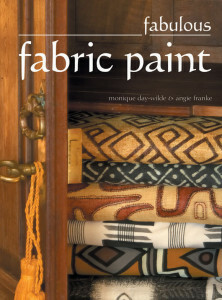 Play around with the same colour paint on different colours of cloth and see how it affects the outcome. 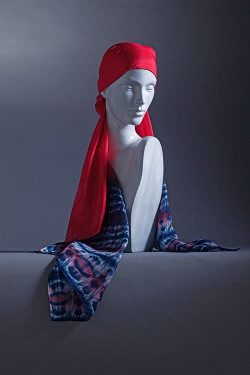 For this project we are going to run a line of prints down the centre of the scarf with some highlights in strategic places in a contrasting colour. The same pattern in a strong colour is striking and bold without being too busy. This texture works very well for fabrics for quilting and fibre art projects. 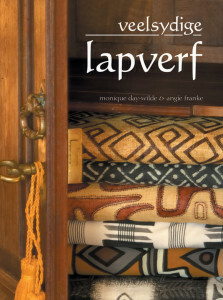 I used a raw silk with a crisp texture because it gives crisp, crackled marks with this binding technique.